SeaSol’s latest victory is over FPI Management, a national real estate management company with properties in over ten states. 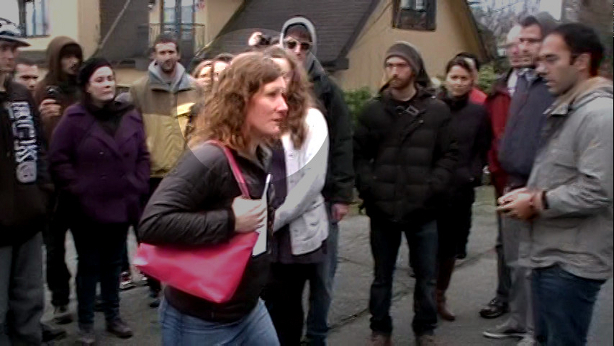 This particular fight focused on a case of blatant deposit theft at Tressa, a north Seattle apartment complex. When Hayward moved out of Tressa, he and his family were told the apartment looked fine and only $60-70 would be deducted from his security deposit for general cleaning. However, Tressa kept $388.44 from his deposit claiming they had to replace the entire carpet due to stains. When asked for evidence, Tressa management produced pictures of a filthy carpet from a unit that was not even Hayward’s apartment! Hayward’s younger brother Sahara was considering taking the property manager to small claims court over this theft, but when he heard about SeaSol he decided to take the direct action route. As usual we put up “DON’T RENT HERE” posters around the neighborhood and eventually some of other FPI owned properties in the area. Through online research and hearing from other tenants, we learned that cutting corners on maintenance and ripping off tenants seems to be FPI’s basic business practice across the country. The weekend of our first picket at Tressa happened to coincide with our first International Solidarity Network Conference! 15 representatives from solidarity networks and similar organizations were in town to share experiences, get trained on specific skills and learn from each other. The timing could not have been better. 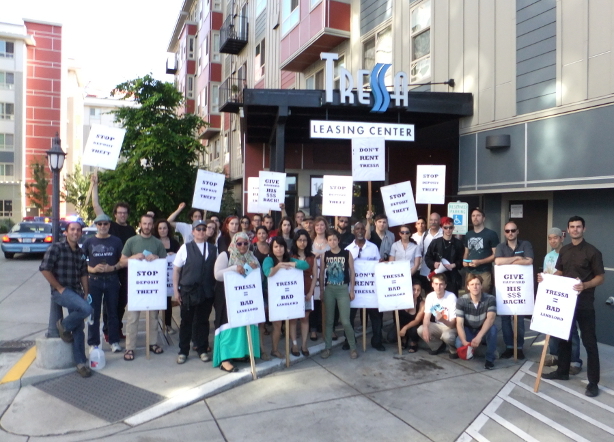 What started off as a small picket directly in front of Tressa’s leasing office eventually grew into a rowdy 40+ person picket as conference attendees and local SeaSol members came over by the carload. We got attention from everybody: office staff, current tenants and even prospective tenants who were in the middle of a tour. It all started when Jumbo refused to give Marco breaks, overtime pay, or even to pay him minimum wage. That’s right. Marco worked ten or twelve hours a day washing dishes for a flat rate of $60. This came out to about $6 an hour, well under the required legal minimum. When confronted about it, Kevin, the Jumbo manager and nephew of the owner, simply refused to pay more. 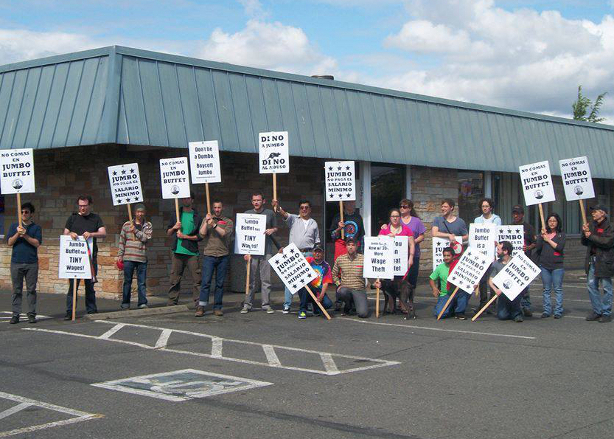 At our first picket, with Marco leading the way, we shut down their lunch rush, emptying out their parking lot in just an hour’s time. We had inside information and continued our pressure campaign, targeting their busiest times: Sunday after church, Friday evenings, and Saturday afternoons and evenings. Each time we would empty out or nearly empty out their parking lot, turning away dozens of potential diners, with a loss of hundreds and hundreds of dollars each action. We knew it was only a matter of time before they caved. The emptier their parking lot, the better we felt. One big element of our success was the enormous community support from the people of White Center. Neighbors showed up to each picket; drivers honked; people waved; neighboring businesses put our leaflets in their windows; diners turned around in the middle of the entrance once they learned Marco had been treated so poorly. Children from across the street made their own “boycott Jumbo” signs and posted them in front of their house. Kevin and Jumbo had no idea what was in store for them. It took them several months to figure out that we could shut them down and drive them out of business if they refuse to pay Marco and their workers. Once it became clear we could destroy their business, they tried to negotiate, promising more and more money, up to $3000. On one such phone call with Kevin, Marco told them, “Don’t be stupid, Kevin – I don’t negotiate with my own money.” After three months of pickets and actions, a final day long call-in to Jumbo management pushed them over the edge. We set up a meeting, and Marco got all of his back wages! My partner & I, both longtime SeaSol members and organizers, moved into our apartment in the Central District in June of last year. After about a month of living there we started to notice substantial mold growth in the apartment. We emailed the landlord (a top executive at Starbucks) who suggested leaving the window open when we took a shower and cleaning it using bleach. The mold continued to spread despite this “treatment.” Every time we cleaned the mold it would grow back right away, and with renewed intensity. Worse than that, I was experiencing light-headedness, dizziness and low energy, especially after I cleaned the mold. As the mold infestation continued to worsen, my partner developed a low-grade fever, his tongue turned white, and his doctor recommended in writing that he move out of the apartment as soon as possible. Our dog developed allergies that caused open sores on his legs as well as ear infections requiring several trips to the vet. It became clear that it was no longer safe to live in the apartment and after being out of the apartment for just a few days, all of our symptoms, even our dog’s allergies, began to clear up. Back at the apartment our landlord refused to consult mold specialists or make any serious attempt to get rid of the mold. We told our landlord that our apartment was uninhabitable and moved all our possessions out on Dec.18th. In response, she insisted we were breaking the lease and threatened to sue us for “waste.” She refused to give back more than $400 of our $1000 deposit. Meanwhile, we were seriously struggling to get the money together to get moved into a new place. We called SeaSol. SeaSol voted to support us in a direct action campaign demanding that our former landlord return the missing $600 of our deposit. We arranged a fake showing at one of her properties and planned to present a letter to her outside the house en masse demanding that she return our stolen deposit. At the pre-action huddle, standing around me, supporting me, were about forty people. We headed toward the corner where our former landlord was expecting to meet “Sarah,” a fake tenant. There were close to forty of us marching down the middle of the street. As we approached she and two prospective tenants tried to skirt the large, silent group but I stepped toward her, letter in my hand, and said her name. Quickly, and while the tenants were still listening I explained to her that the letter was “in regards to the $600 of our security deposit that was taken”. At this point she was surrounded by all forty, intensely quiet and serious-looking SeaSolers. She took the letter, said as professionally as she could that she was going to read it later, and scurried off to get in her BMW. Unfortunately for her she was parked on a dead-end street, so the experience was not over until she had started her car, turned around and slowly driven past all of us while we watched and filmed her. As soon as she was out of view we erupted into applause and whooping. I felt an unprecedented surge of empowerment. Within ten days our landlord sent us an email stating she would pay back the $600! She was apparently unwilling to face the prospect of that same group of forty people staging future actions. Thank you so much to everyone who supported us. Luis and SeaSol have won our second fight against Pegasus Pizza. A few months after our last encounter, Luis was fired for being a few minutes late due to delays in his Metro commute (something that happens to other workers all the time without reprisals). Recognizing this as blatant retaliation for fighting back on the job with us last winter, we demanded that Pegasus Pizza either give Luis his job back or pay him for the two weeks of wages he lost while he was out of work (approximately $600). More background on this fight and the real reasons for Luis’s firing can be found here. When we started to pass out leaflets in front of their door, many West Seattle locals were not surprised to hear about Ted or Sarah’s exploitative behavior. We heard many stories of people’s friends, family and neighbors having their time sheets tampered with, wages docked and stolen outright in the past. We also received numerous phone calls and emails from former employees that confirmed that Pegasus has been routinely stealing workers’ wages for years. We began to compile these stories into a public blog that the General Manager of Pegasus, Sarah, told us herself was very damaging to their reputation. The owner, Ted, responded by coming into Luis’s workplace and threatening his life. Sarah on the other hand responded with a short press release that claimed they had time sheets proving Luis’s tardiness. We wondered how seriously we were supposed to take these time sheets, after hearing multiple stories about management routinely editing them for their own benefit. We hope that Ted and Sarah have learned their lesson and clean up their act before another worker who has been trampled by Pegasus decides it is time to fight back with our help.